This SMARTStart Lean Visual Management Kit is the ultimate for a wide range of projects that make management and communication easy and effective. When you use these tools effectively it helps provide clarity, build team work, and, above all, it’s fun! 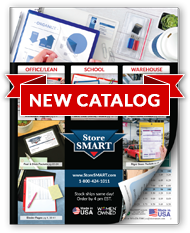 So if you and your team need an easy, well-formed, multi-use tool kit for your communication dry-erase board needs, this is the SMARTStart Kit for you! And the best part? You look fantastic! Similar to Post-It Notes, these write-on magnets are used with dry-erase markers to color code and clearly visualize tasks (as well as anything else you may want to post). With up to 6 different colors, it’s easy to quickly show what task is designated to whom and/or the status of that task. They are stackable - two or three up - with different sizes and styles. And don’t worry - if the color stains or someone uses the wrong type of marker? Hand sanitizer to the rescue!! These handy magnetic windows serve as the perfect label for your boards. No sticky labels leaving behind residue that looks and feels terrible and ruins your board! Easily mark progress, status and points of interest on your board with these Smiley Face Status Indicator Magnets! They can be placed over a SMART Card or SMART Note. Three colors: Green, Yellow, and Red. . Use these faces in 1”, 2”, 3” and 6” sizes, and make communication easier than ever. Add emphasis where you need it, with arrows, various color stars and green check marks and red “X”s! “Done” or “Incomplete”, “Right” or “Wrong”, use them however you need! Perfect to keep track of an employee’s training progress or note a department’s performance! Our customers have told us so many different uses. Please let us know how you use them! Need to make a graph or table on your magnetic whiteboard? Magnetic Grid Line Rolls are here to save the day! 25 feet of ¼” wide magnetic lines to help you clean up your board and really utilize the Lean Visual Management techniques! The lines are also available in ½” and 1” wide styles. Easy to move, straighten or lengthen. No more smudges of marker on your clothing and hands. Don’t forget the markers! Magnetic Dry Erase Markers that are double tipped and come with a handy eraser already attached to each cap! Less clutter, less fuss = Lean! One marker = two colors, two erasers and two magnets: Dark Blue & Black; Cyan & Green; Orange & Red; Fuchsia & Purple. 8 colors but only 4 markers! To complete your board, you’ll need somewhere to put completed and/or update reports. With our Magnetic Closure Pockets (patent pending), easily win the fight against gravity and have your documents stay put! Each jacket is sealed on two sides, with a strong corner magnet to secure your documents (up to twelve letter-size sheets of paper). Two 11" magnets mounted on the back of each pocket allow you to stick them on any magnetic surface in order to display information. Available in an array of colors and sizes! The Open Face Frame Document holder with Magnets allows you to display your paperwork neatly, while the open center means you can write on your paperwork without taking it in and out the pocket. Great for Schedules, K Cards, Sign-in Sheets, and more! Last, but never least, our Rigid Print Protector! Protect workplace safety posters from staining and fading. Proudly display project photos inside and keep them safe from dust, water and over-eager hands. You can even write on it with dry-erase markers to help keep track of data. In conclusion - this SMARTStart Kit is perfect for your Lean Startup plans! Buying this kit also means you’re saving 20% ($38.47) on the whole package. It really is the SMART way to go Lean!